With this inauguration of our new website, I wanted to give all of you a very special gift, as there are so many things I can and will recommend over the days, months, and years to come. 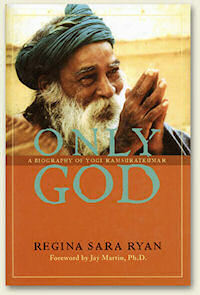 The book Only God: A Biography of Yogi Ramsuratkumar (written by Regina Sara Ryan) is this perfect gift. Of all the books I have read about God-realized beings, this one is a standout among standouts. It is quite possibly the most amazing, humbling, and inspiring book I have ever read about a living Master. This book has changed my life (and it just so happens that I read it earlier this year, in 2008). Anyone who reads this book will gain an entirely new understanding of the Greater meaning of “God’s will,” as well as its application to our day-to-day circumstances—particularly the difficult or troublesome ones. Furthermore, this mahatma’s life will gift you with the quintessential understanding of the words “surrender,” “faith,” “humility,” and “acceptance”—the four divine character traits most needed in this time of rapid upheaval and change. Timely this book is, especially now, as many are being confronted by a rapidly changing world which is challenging so many people’s fierce desire to maintain control of their lives, as (what they thought to be) the bedrock foundations thereof are suddenly and seemingly turning to quicksand. Yogi Ramsuratkumar’s astounding (nay, “jaw-dropping!”) example of surrender and unequivocal acceptance of all circumstances and events will gift the reader the strength and understanding necessary to easily and gracefully move through this pivotal time in Earth’s history. Yogiji’s life is a role model that will stand tallest among the annals of time, and a barometer by which unconditional surrender and acceptance can and must be measured. This book is more than a “read” of his life. When you reach the back cover, you will verily have walked with him—and in his shoes, as well as in the shoes of those who walked with him and witnessed the miracle of his selfless and unlimited love. To say I highly recommend this book is a gross understatement. This is a “must read” if ever there was one. You might just find this book to be a permanent fixture by your desk or nightstand (as it is for me), an oracle and friend in the worst and best of times. “Thank You,” Yogi Ramsuratkumar, for your life and example; and “thank you,” Sara Regina Ryan, for immortalizing this saint for all the world, by way of your gifting us with this book. Vande Mataram! Jai Sri Ram! Jai Yogi Ramsuratkumar! My Master blesses you! This sadhu, initiated disciple of Yogi Ramsuratkumar, would like to download references to this sadhu in the precious work of Regina Sara Ryan for the benefit of our devotees.